Researchers match recent and future climates to show what American cities will be like in 60 years. If climate change proceeds unchecked, the Pittsburgh of 2080 may feel like a recent northeastern Arkansas. (Inside Science) -- In 60 years, the climate of Pittsburgh, Pennsylvania, will feel kind of like a contemporary Jonesboro, Arkansas, with higher temperatures and more winter precipitation, according to a new study. That's assuming fossil fuel emissions continue to rise; if instead we succeed in curbing emissions, Pittsburgh will instead become more like Madison, Indiana. 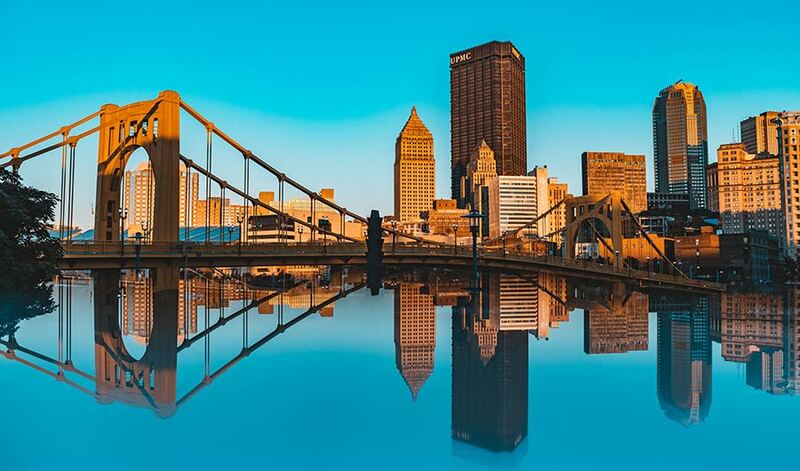 Pittsburgh is one of 540 cities in the U.S. and Canada for which scientists have found doppelgangers of their climate futures -- places where the recent climate is as close as possible to another city's future climate. Anyone can explore the findings using an online interactive map. The results were published today in the journal Nature Communications. The researchers compared each city's expected climate in the 2080s with recorded climates from 1960-1990. To estimate future climates, they took the average of outputs from 27 climate models. Each recent and future climate was characterized by total rainfall and average minimum and maximum temperatures for all four seasons. Under a scenario with high fossil fuel emissions, the average city's climate doppelganger was more than 500 miles away. Under a low-emissions scenario, that distance dropped to about 300 miles. Western cities tended to "move" toward hotter, drier regions of the American Southwest, while cities in the Northeast grew to resemble humid locations in the Midwest and Southeast. For each city, the researchers found the best match they could within the study region, which spanned the western hemisphere north of the equator. However, they struggle to find perfect matches for the future climate of some cities, especially for those along the western and southeastern coasts. For example, compared to its best match of 1960-1990 era Las Palmas, Mexico, the Los Angeles of the 2080s is expected to have more rain in winter and spring and less rain in summer and fall. According to the models, the climate in cities like Los Angeles will be unlike anything that currently exists in North America.